Custom cushions are always a great way to decorate a new patio area or poolside. At Cushion Source we can custom make any type of cushion you want. We use the same high quality acrylic fabrics by Sunbrella, so your accent pillows, chaise lounge cushions or furniture cushions will last the outdoor elements. Quality and durability are what set our outdoor and indoor furniture cushions apart. 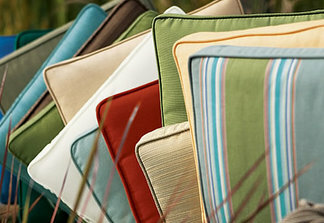 Sunbrella is the leader in outdoor furniture fabrics, available in hundreds of solids, stripes, jacquards, and textures. Our furniture cushions are filled with your choice of compressed, layered polyester filling or high density foam. Poly fill has a much lower water retention level than the foam that is used in most indoor cushions. The poly fill material drains water and dries much quicker than foam, depending on the weather conditions present at your setting. The compressed nature of the poly fill closely replicates the firmness of traditional upholstery foam. Custom replacement cushions are our specialty at CushionSource.com. Give your existing outdoor or indoor furniture a fresh new look with quality cushions that are long lasting. Beautify your space with custom made cushions and turn your outdoor space to a sanctuary of color, comfort and style.